EUGENE, Ore. — Sept. 4, 2018 — Accurate projections of sea level rise require sophisticated models for glacier flow, but current approaches do a poor job capturing the physical processes that control how fast glaciers slide over sediments, according to University of Oregon researchers. In a new study, the UO team, led by postdoctoral researcher Colin Meyer, offered a theoretical approach that helps to shed light on what they call the dirty, dark undersides of glaciers and improve the modeling of ice flow. 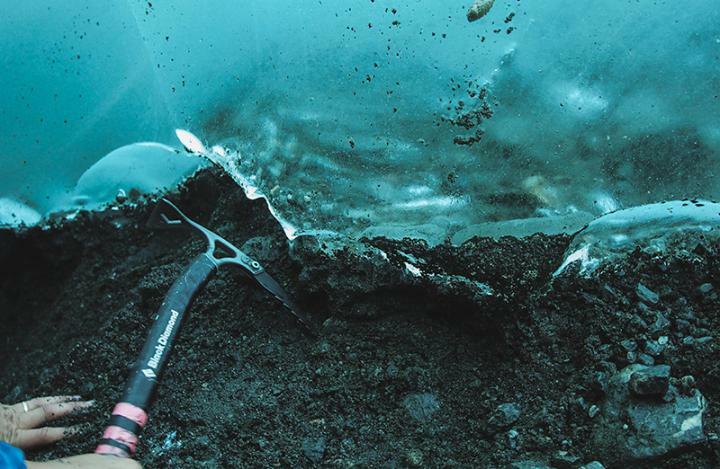 Detailed in a July article in the journal Nature Communications, the approach captures how the amount of sediment frozen to a glacier's base varies with the underlying water pressure, melting rate and particle size. It helps account for resulting changes in frictional resistance to glacier sliding. To illustrate their theory, the UO researchers noted that regardless of the size or weight of a glacier, sliding accommodates ice flow that is driven by gravity and adjusts surface slopes so that friction at the bed never exceeds more than about 1 bar of stress. "This is a longstanding problem," Meyer said. "If we want to forecast what glaciers are going to do in the future, we have to talk about the place that we can't see: the interface between the ice and the bed." Formulations dating from the early 1950s attributed this upper stress limit to the plastic-like nature of ice deformation. In their paper, however, the UO researchers noted that 50 percent of all glaciers, including those that move the most ice off land in Greenland and Antarctica into the sea, are sliding. The earlier explanation for 1 bar of frictional stress was based on observations by Paul Mercanton, a Swiss geophysicist, in 1950 and the analysis of John Nye, now professor emeritus at the University of Bristol in the United Kingdom, in 1952. "Nye's work carried the caveat that the formula only works for non-sliding areas," said Alan Rempel, a professor in the UO's Department of Earth Sciences and the paper's senior author. "It's not the complete story. It only applies if the glacier is stuck." Using their new theory, which combined mathematical analysis with satellite data and geological evidence from regions previously covered by ice sheets, the UO team matched the 1 bar limit. The result provided confidence that freezing sediments is the physical process that controls the friction of the ice-sediment interface. The importance of freezing sediment, Meyer said, will be influential in developing more accurate ice flow models. The theory's incorporation of freezing sediment provides a more complete view of glacial movement, Rempel said. "It focuses on the sliding and should help scientists accurately find the velocity of an advancing or receding glacier." "If we want to understand how fast sea levels are going to rise, we need to know how fast the ice sheets are going to disintegrate," Meyer said. "We need to understand the role of friction at the base of a big glacier. Does water lubricate the interface or is the glacier frozen to the sediments? This friction sets how fast glaciers can flow." The rate of sliding, Rempel said, is key to understanding impacts on sea level. "The hypothesis that we've pushed forward is that the physics of how glacier ice interacts with its bed is exactly the same physics as how ice interacts with dirt in the world around us," Rempel said. "What we've looked at are conditions under which ice will just slide over dirt versus when ice sinks into and takes the dirt along with it." Incorporating frozen sediment into sliding laws, Rempel said, will lead to more accurate projections of sea level rise based on glacier-related conditions. Anthony S. Downey, who was an undergraduate student during the project, was a co-author on the paper. He has since graduated and will begin graduate school this fall at California State University, Northridge.